Making your O.R. Ready to Go Safely, encourages other hospitals around the world to do the same and improves the outcomes for your patients and all patients. Help improve the Outcomes for Six Million Patients, become ORReady. ORReady is a worldwide, multi-Specialty initiative to encourage steps that are known to improve surgical outcomes and save lives. Working together, Medical Societies and Other Organizations around the World are sharing ideas that work to help improve Outcomes for Surgical Patients. By using, analyzing and continuing to improve guidelines and procedures, including Check Lists, Time Outs and Warm Ups, we estimate that Six Million patients around the world could have better outcomes. That’s 2-3% of the approximately 250 Million surgeries that are performed worldwide each year. 1. Download Outcome Commitment Letter for your hospital CEO or Department Chair to sign and to keep in your hospital’s files. 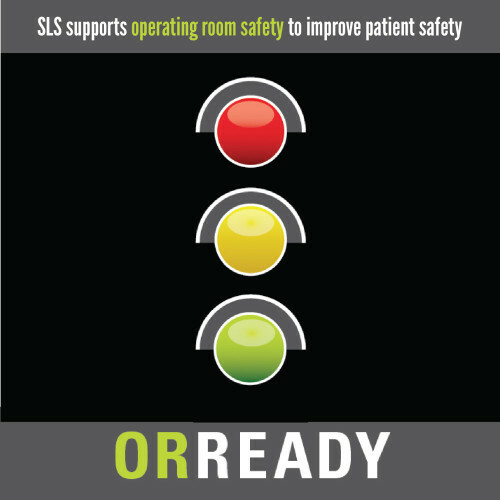 ORReadySetGo Safety Light Poster for staff reminder. ORReady for hospitals who commit and register. 2. Choose a Set Of Protocols (many are available in the literature, and some can be downloaded from links on this site. We don’t recommend specific protocols. Those posted here are recommended by experts in the field. You and your staff should decide which will be most appropriate for your situation. 3. Medical Societies, Health Organizations, and Hospitals only: Register as an ORReady Medical Society or CenterOfMerit to encourage OR Safety and better Outcomes. WHY SHOULD YOUR MEDICAL SOCIETY/ORGANIZATION BE ORReady AND YOUR HOSPITAL BE AN ORReady CenterOfMerit? WHY SHOULD YOU PROMOTE THIS WORTHY CAUSE? Over Two Hundred and Thirty Million Operations are performed worldwide each year. Experts estimate that by following a series of safety guidelines, 2-3 %, roughly Six Million surgical patients around the world, could have better surgical outcomes annually. While this may help only a small number of patients in a small local hospital, cumulatively it has the potential of being beneficial to an enormous number of patients worldwide. These are the patients and people we all care about. As dedicated professionals we are committed to continually improving the health and surgical outcomes of all our patients. Our hospitals are pillars of our communities. We want our hospitals and departments to excel at providing nothing but the best possible care for every patient. ORReady suggests Easy Steps that, if followed by hospitals and surgeons, can create worldwide Centers Of Merit and improve the surgical outcomes for patients globally. Research has confirmed that multiple industries benefit by applying the safety steps summarized here. When applied in the operating room, these same steps can and do reduce complication rates and improve outcomes for our patients. Top centers, leading surgeons, nurses and OR teams in multiple specialties have adopted various forms of these steps, and have been reducing error rates by 40% and cutting death rates in half. Regrettably, many hospitals and surgeons worldwide have not yet instituted these good-outcome-producing principles. Our goal is to encourage worldwide use of the ORReady Steps in all hospitals within Six Years. Once followed, this would improve the outcomes for 6,000,000 patients worldwide annually. Hospitals and Surgical Organizations that adopt ORReady can register with a Database to offer feedback and be part of ongoing research that will continually help improve our surgical outcomes. The Database is open-access and available for sharing with anyone who is conducting medical research. Institutions may register with the Database and opt-out of the research feedback loop if they choose. ORReady Advisers are leaders of Surgical, Nursing, Medical, MIS Societies and Health Organizations from Multiple countries who share the idea that by working together with the power of the Internet and cooperative research we can accomplish great things. Organizations who choose to participate are encouraged to appoint a leader to the ORReady Advisers Group. Thank you to the many people and organizations around the World who are working on this very worthy project and who are encouraging the use of outcome-improving principles in surgical care. We encourage Organizations to join this worthy cause of helping save lives and improve the outcome. This site follows the Creative Commons guidelines. We encourage you to copy and use any materials that will help improve surgical outcome and create CentersOfMerit in Surgery and MIS. Recognized as an innovative contribution to the field of CME, ORReady has been selected for the ACME 2011 Medical Specialty Societies Member Section Great Idea Award. This award recognizes an innovative contribution to a member type such as a best practice or program that promotes sharing an/or collegiality. The award was presented on Wednesday, January 26, 2011 at the Alliance’s Annual Conference in San Francisco. This is a great first step towards recognizing this important initiative to improve patient safety worldwide. Thank you to The Society of Laparoendoscopic Surgeons SLS and its SuperDoc members for hosting the ORReady site. As with all SLS sites and publications, this one is offered as Free Open-Access and uses the Creative Commons Copyright. You can copy and use any materials from this site for educational, non-profit purposes.